Whilst Britain shivered in February's chill, the weather at the Auto Club Raceway at Pomona, California luxuriated in temperatures in the mid eighties and delivered what turned out to be the quickest Funny Car field in history. Top Fuel and Pro Stock was no easy contest with the former being just 0.053 seconds off the national record and the factory hot rods a mere 0.032 away from their best. In the first round the combatants battled a hot and tricky race track that continued to throw a curve ball throughout the rest of the eliminations to the unwary. Not surprisingly it was ‘The Sarge' Tony Schumacher that led with a fine 4.490/317 the only 4.4 in the event. There were upsets in the first round as big names such as Brandon Bernstein Cory MacClenathan and Clay Millican bowed out, the latter two, victim to tyre smoke and Bernstein loser to David Baca in a close call. Other names not to make the next round included Bruce Litton, Dave Grubnic, Rod Fuller, Doug Foley, Hillary Will on her Top Fuel debut and JR Todd the young black guy who led qualifying on Friday. Round two kicked off with a 4.56/320 win for Doug Herbert as he holeshot Larry Dixon's 4.59/320. Morgan Lucas managed a good leave and stayed ahead to beat Rod Fuller in a 4.54/321 to 4.58/320 dual. Doug Kalitta's day ended when the Mac Tools machine went up in smoke but peddling it got him nowhere as his 6.70/144 attested, allowing David Baca's plain red and black car won with a fine 4.73/276. Melanie Troxel laid the law down to teammate Tony Schumacher in the last of the round when her Skull Gear fueller managed a 4.52/325 over a losing 4.53/321. Doug Herbert's Snap-On Tools car went into deep tyre smoke from the sixty foot mark, his 5.73/233 lost to the charging 4.62/326 from Baca's machine. Troxel meanwhile ended the semis with a good 4.55/321 drumming of Morgan Lucas' flaming 4.75/ 290. 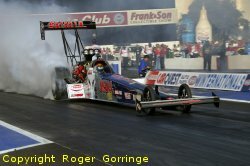 The final pitted David Baca against Melanie Troxel and it was all over by one hundred feet as Baca's Mach 1 dragster fell foul to tyre smoke and ran an 8.67/91 lose leaving Troxel's Skull Gear/Torco Race Fuel car to earn her the 4.58/321 victory. 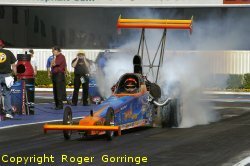 It gave her her first Top Fuel trophy and made her the first female to take a win since Christen Powell in 1997. John Force took the brand new Castrol GTX Ford Mustang to each qualifying round high and made the last one on Saturday the one to remember as he blistered the records with the quickest ever Funny Car pass in history, a 4.664 at 329mph. Again, crews wrestled with the track and many heavy hitters failed to make the next round, among them were Eric Medlen, Tony Pedregon, Cruz Pedregon, Tommy Johnson Jr. Tony Bartone, Whit Bazemore, Tim Wilkerson and Gary Densham with half going up in smoke or getting loose. The quarter finals opened with a win for Ron Capps as Jim Head got loose at half track, the 4.81/325 getting the nod. Up in smoke went '05 Champion Gary Scelzi in the Oakley Dodge a fact that allowed Bob Gilbertson to push his Autolite XP Spark Plugs entry to the 4.88/283 win to the losing 6.90/131. 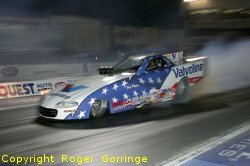 Del Worsham put up a good fight but couldn't get past an engine destroying, body damaging Robert Hight, winning number was 4.76/326 to the 4.83/318 lose. The final pairing of the round saw a surprise lose as John Force blazed the tyres at half track and turning in a lowly 5.70/180 as Phil Burkrt Jr. took full advantage with a 4.84/319 win. The semis saw the end to Bob Gilbertson's weekend as he fell foul to the tyre smoke demons only to see Ron Capps keep his slight lead off the line and record a 4.81/322 win to the slowed up 11.04/79. 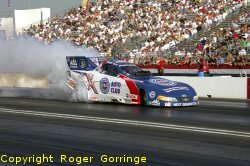 With all the resultant damage from the last round only just repaired in time including having to use the '05 show car Auto Club of Southern California Mustang body Robert Hight zoomed to the win with a 4.79/327 win sending his boss Force into raptures as Phil Burkart's 4.86/320 in the Checker Schucks Kragen Monte Carlo came second. For the final Robert Hight made good the Force team name as he pushed the Auto Club Mustang to a great 4.76/317 event win by a half car length at the finish as Ron Capps in the Brut Dodge Stratus came behind with a close 4.77/323 runner up. 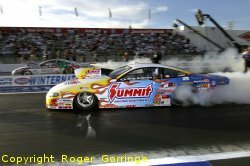 The two Summit Racing Equipment Pontiac GTOs of Jason Line and Greg Anderson ruled the qualifying throughout with the '05 Champion ending up tops all the way through. A 6.665 at 207mph gave the Champ the top numbers a feat that was not repeated until the final round. First round losers numbered Ron Krisher, Richie Stevens, Kurt Johnson, Greg Stanfield, Jim Yates, Allen Johnson, Bob Panella Jr. and Dave Connolly. Erica Enders had run well in qualifying and round one but her Slammers Ultimate Milk backed Chevy Cobalt ended its luck with a 6.81/204 defeat that saw Mark Pawuk take a 6.76/205 win. In a real close call Mike Edwards managed to hold on to his slight starting line advantage and take a 6.723/206 win against the 6.725/206 lose by Warren Johnson. Larry Morgan put paid to Jason Line's advances with a 6.73/206 win against the 6.71/206 lose. Greg Anderson continued his inexorable progress with a 6.69/207 win as Rickie Smith trailed with a 6.72/205 to end the round. In the Young Life/Art Pontiac GTO Mike Edwards pressed forward with a 6.72/205 win that put away Mark Pawuk's 6.77/205 and Larry Morgan's Dodge Stratus' 6.73/205 succumbed to the rampant 6.68/206 from Greg Anderson. Starting where he left off late last year Greg Anderson pushed his Summit Racing Equipment Pontiac GTO to take the season opener event win with a two car length 6.665/207 win over Mike Edwards 6.72/206 try. The Top Alcohol Dragster win went to Duane Shields with a 5.47/252 win over Aaron Olivarez who runner upped with a 5.61/254. Top Alcohol Funny Car had Jay Payne ease out Frank Manzo in a holeshot 5.60/254 win to the better 5.59/259 lose. Competition Eliminator saw Lou Ficco Jr. take his '04 Cavalier to the winners circle with a 7.84/123 win over Dean Carter's dragster, 7.15/150. Super Comp was wound up by Anthony Castillo with a 8.88/170 triumph as Keith Downing runner upped with a 8.86/165. Val Torres Jr. took the Super Gas final with a 9.902/149 leaving Bill Omher to take second place with a 9.903/146. In Stock Eliminator Keith Lynch took the trophy with a 10.46/113 in his '70 Camaro to the runner up from Dave Rampy's'67 Camaro with a 11.17/116.